After all the wine & sun & music, it was time for some dining–specifically a meal at Blue Apron Restaurant in Salem (the town connected to Roanoke). (Oh, p.s. their website now has a menu & some other useful info–hurrah!) I booked the meal a week in advance since the restaurant really fills up, and at 7:30 on a Saturday night it was jam packed with diners. We ordered a bottle of Riesling to split and decided on four small plates to share: scallops, lamb, duck, and swordfish. Given that we’d only visited during winter-y months before (first visit, second visit), I was excited to see what the kitchen would do with late spring, early summer ingredients and, thankfully, I wasn’t disappointed. Our started was the scallops–Pan Seared Sea Scallops, Jasmine Rice, French Lentils, Coconut-Green Curry, Peach-Mango Gastrique. Oh. My. Scallop. These were intensely wonderful. 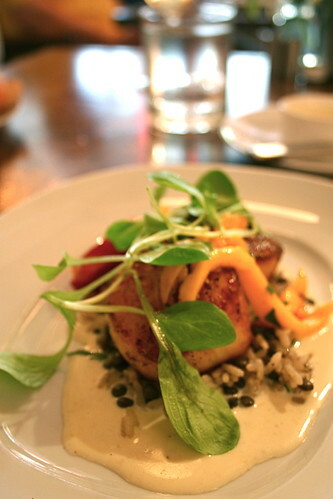 The scallops themselves were seared perfectly and rested on a bed of rice, lentils, green curry, and the gastrique. I’ve never thought of pairing scallops with green curry, but the flavors are perfect together. Nothing spicy at all, just creamy-smooth lightness tempered with the fatty coconut milk, the slight crunch of the rice and lentils, and the bright punch of the mango and peach. My mother, who was averse to ordering the dish since she doesn’t like scallops, was fighting me for the last bite. It was that darn good. I wish we’d ordered the large dish for sure! The other three dishes arrived at the same time and we shared them at the table. First up, the Pan Roasted Spring Lamb, Caramelized Onion & Fontina Tart, Basil Pesto, Tomato-Eggplant Ratatouille. This dish ranked a close second for G to the scallops and featured roasted lamb with a creamy fontina tart underneath, basil pesto drizzled throughout, and a side of the ratatouille. I have to admit, the ratatouille felt like a weird afterthought, especially given how wonderful the lamb, pesto, and fontina worked together. It tasted great (I mean, what’s not to love about tomato and eggplant? 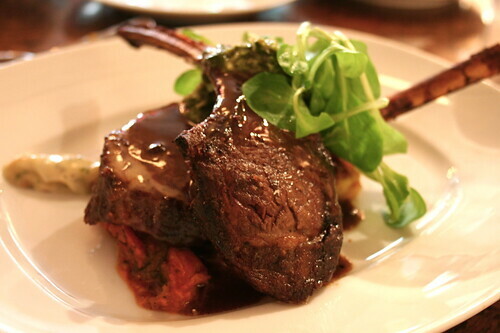 ), but I felt that it detracted from the perfectly roasted lamb (medium-rare), spicy-herbed pesto, and the rich cheese and onion tart. Those other elements were spot-on and plate-licking good. While I did, but with a piece of bread, you know, to be polite and all. 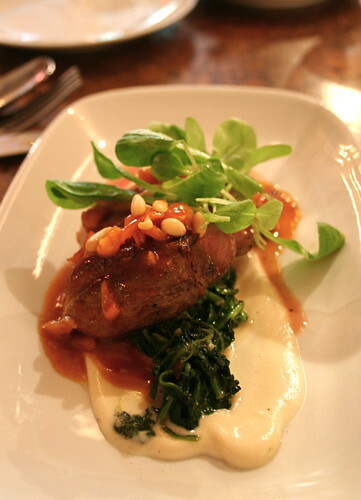 Third was the Pan-Roasted Magret Duck Breast, Apricot Gastrique, Spinach, Pine Nuts & Cauliflower. I ended up being the only champion of the dish–everyone loved loved the flavors, but the medium-rare temperature left the duck a little chewy to G & my mother’s preference. I’m more forgiving–it was cooked a perfect medium-rare, but I understand where they’re coming from & I should have asked for it to be cooked to medium instead. You learn over time. As for the duck, it was rich and juicy and paired great with the cauliflower puree, apricot, and spinach. Classic flavors with a slight twist–cauliflower for potatoes, apricot for orange–and, again, I cleaned the plate with some bread. A fresh take on a classic French dish. 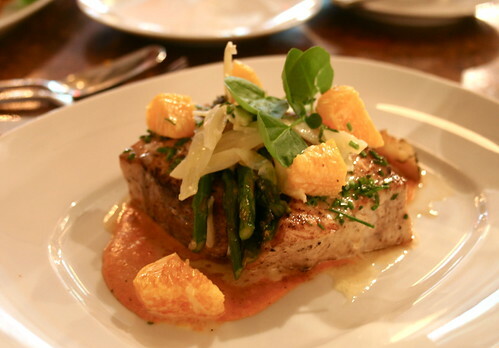 Last came the fish–Herb-Basted Swordfish, Hazelnut-Red Pepper Romesco, Grilled Asparagus, Citrus, Fennel, Cottage Fries. Originally, the dish featured Black Grouper, but it was sold out and the kitchen subbed Swordfish (a great swap). I’m never the biggest fan of swordfish–a little to “meaty” for me–but this one was cooked beautifully and tasted like a breath of late spring when paired with the asparagus and citrus-fennel garnishes. My mom, for one, attacked this plate–now that she lives in Mobile, I think she’s dying for a nicer take on fish than simply fried and this swordfish hit the spot. I, for another, was originally skeptical of the dish, afraid I wouldn’t be won over by the swordfish, but I gave in after the first bite to its fresh, bright flavors, an earthy hint from the romesco. Gotta say, Blue Apron woos me every time. And, hello, portion size is insane there–we ordered and split four small plates and were more than satiated. And we’d been drinking all day. There’s really something to say about that. I harp on people here for their emphasis on “value” when picking a restaurant or deeming one as “good.” Hate to say it, but when a bottle of wine and enough food to feed three prices in at well under $100, you’ve no choice to say but “good value!” G & I really need to add the restaurant to our semi-regular rotation. No idea why we haven’t yet–there’s so much to love! 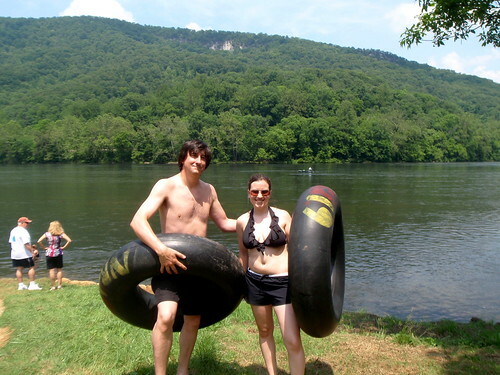 The next day, Sunday, we headed off to Blacksburg for some tubing fun at New River Junction. 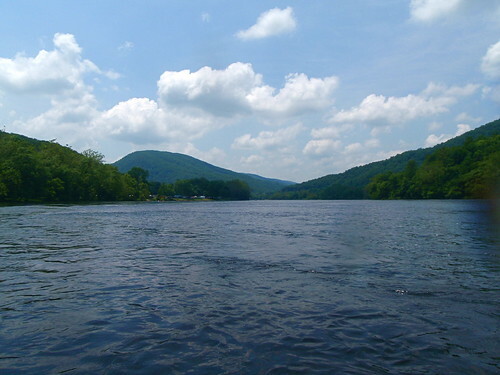 Not my first time tubing there by far, but one of the best river runs I’ve ever had–the day was clear and hot (past 90 degrees Fahrenheit) and the water was high enough that bottoming out on rocks wasn’t a problem (plus the rapids were super fast and crazy). One of my favorite parts about NRJ is that you can bring a cooler full of stuff to grill, hand it to the guys who run the bus back and forth between the start and the finish, and tube down the river while they set up a grill for you, get the coals hot, and it’s ready to go when you arrive. For $9 per person, you can’t beat it. 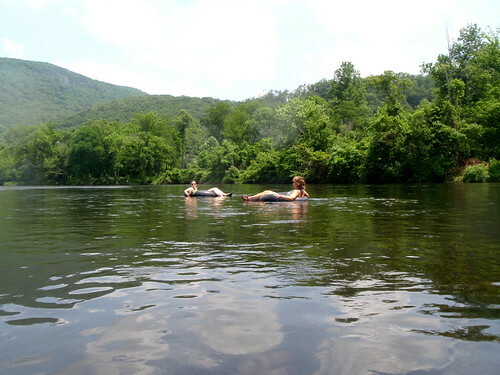 Plus you get unlimited river runs between 11 am – 6 pm (each trip lasts 45 min-1 hour), so there’s plenty of time to spend in the river before and after grilling. Oh, and another perk? Butterflies might just befriend you! 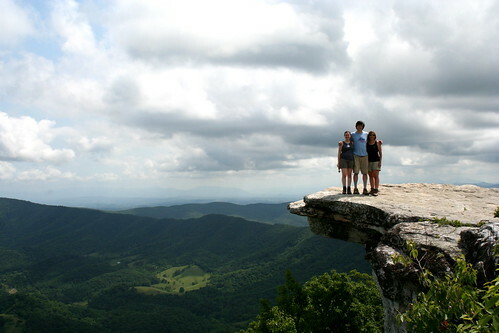 To close up the trip, on Monday we decided to hike the iconic McAfee’s Knob. Somehow it was my fourth hike on the trail in less than one calendar year, but it’s so different every time depending on the season. 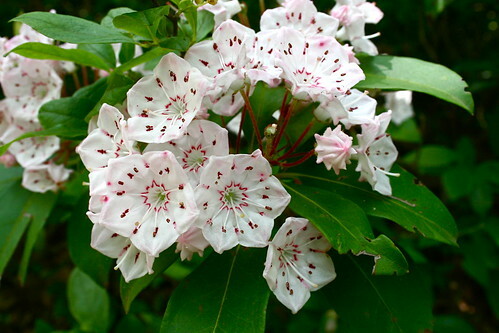 This time, the leaves were completely out and the mountain laurel was in full bloom. Absolutely gorgeous. There’s something about hiking out here that completely centers me–I mean, I get to live here! In this ridiculously beautiful place! There are mountains right outside my window and less than a 20 minute drive away. I’m not quite sure how I got so lucky, but I’m not going to complain. 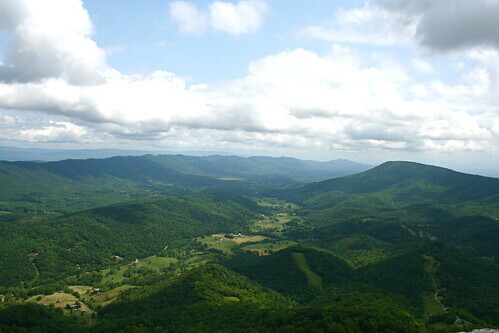 Roanoke may have a few drawbacks, but the mountains are worth more than their ancient weight in gold. Hike accomplished, my mother and I spent the next day antiquing and going to a large garden center to dream about plants. We even caught Sara Watkins (formerly of Nickle Creek–one of my favorite bands) at Kirk Avenue (a tiny little music venue here in Roanoke) on Monday night. Seems like things were destined this past Memorial Day weekend to be good. what gorgeous plates!! and that scenery! absolutely breathtaking! thanks for sharing! Sounds like a perfect weekend and visit from your mother! 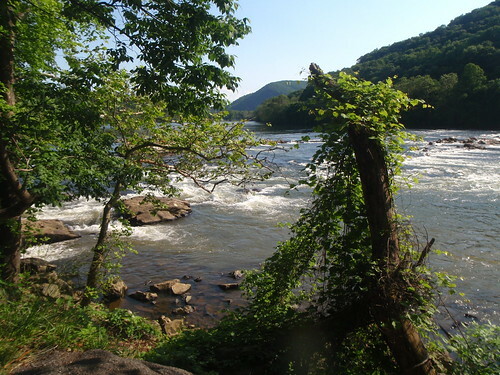 And your pictures are beautiful – Roanoke has much better scenery than we have up here in Northern Virginia! You guys always have the best-looking restaurant experiences! I wouldn’t mind some of that swordfish right about now, for instance. And tubing! I haven’t gone tubing in at least fifteen years. Jealous!